Let the adventure begin right on your patio or sunroom with stunning textured tabletops by Lane Venture’s Weathermaster Synthetic Wicker collection! These wicker tables are made with Fabri-glass, an alternative tabletop made specifically for the outdoors. Fabri-glass is an excellent, high-end European quality composite fabric applied to tempered glass and can be used with captured rim tables. The ‘fabric’ is made by a unique vacuum embossing process that creates authentic texture and consistent color. It has superior resistances to UV rays (4500hours), oil and dirt. Choose an exotic surface from four textures: Brown Crocodile, Umber Rattlesnake, Tan Lizard and Black Lizard. 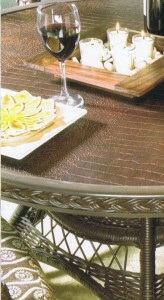 As well, the wicker collection comes in a number of table sizes. For more information and prices, please contact us at info@animalprintessentials.com or call Maria at 314-965-4240 x30.